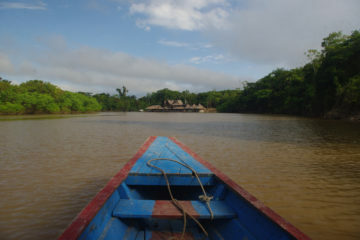 Located a 30 minutes motor canoe ride down the River Madre de Dios from Puerto Maldonado, Sandoval Lake Lodge is perched above what many rainforest specialists feel is the most attractive lake in Southern Peru, if not in the entire Peruvian Amazon. The whole complex is housed in one structure and includes 25 double occupancy rooms with private bath, hot showers, and a spacious dining room overlooking the lake. For a more relaxed, complete introduction to the rainforest, we recommend a two nights stay. However, with the easy access from Puerto Maldonado, for the first time it is possible to spend only one night in the rainforest and still get a good preliminary idea of the splendor of the Peruvian Amazon. Welcome in Puerto Maldonado. Visit the Inkaterra Butterfly House near the airport, check-in, and in only 15 minutes, you can get to the boarding wharf. Begin to experience the enchantment of the rainforest, as you take a 45-minute boat ride along the Madre de Dios River to arrive at Inkaterra Reserva Amazonica lodge. After a short briefing, settle into your beautiful cabaña and enjoy your lunch in the dining room. Take a siesta, share a refreshing tea time and get ready for the afternoon excursion. After gathering with your inkaterra Interpreter, choose from the 14 different excursions available at the Inkaterra lodge. On your first day, we recommend a guided walk along the Trail system, into the Inkaterra Reserva Amazonica natural area, where you will discover the Amazon Basin. This trail offers an excellent introduction to the forest environment, winding past impressive trees such as the Shihuahuaco, and the strangely beautiful strangler fig, offering excellent opportunities for bird watching and observing exotic insects. We also recommend on the first night our Twilight River excursion – a guided afternoon boat ride on the Madre de Dios river. Witness the transformation from a diurnal to a nocturnal world: animals and birds of the daytime give way to species specially adapted to the night. As you enjoy their paradise, you will learn about their habits, while you search for nightjars, owls, capybaras and big caimans. We will gather at The Eco Center and present all available excursions. Enjoy the dinner, served in the main dining room from 7:30 p.m. to 9:30 p.m.
After dinner, you may retire early to your own cabaña, or join us to talk about the experience of life in the rainforest, as you listen to the intriguing sounds of the jungle at night. – the choice is yours. Breakfast begins at 5:30 a.m., for those who want to avoid the heat and enjoy nature at its fullest. A full buffet breakfast is served from 7 a.m. to 9:30 a.m. 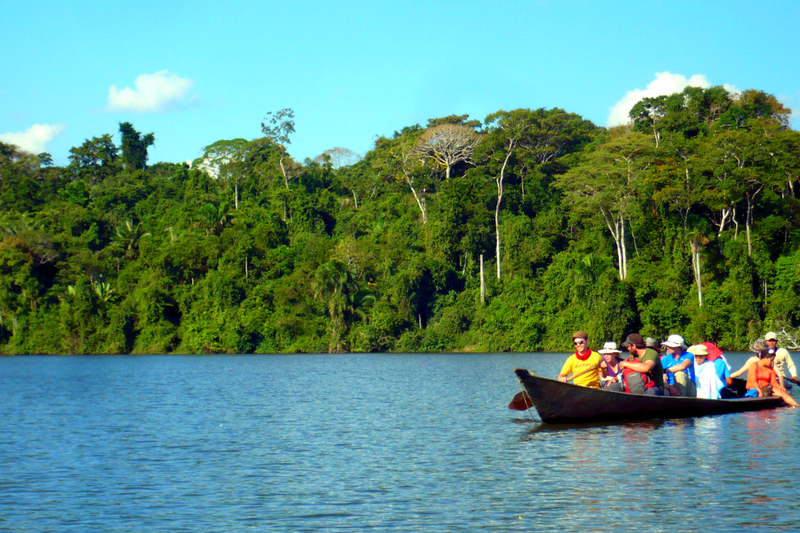 This morning you may visit the Lake Sandoval excursion into the Tambopata National Reserve. 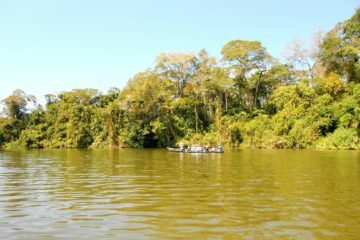 Glide in a wooden canoe, across a beautiful, mirror-like oxbow lake that is home to the endangered giant river otter, as well as red howler monkeys, red-bellied macaws, anacondas, side-neck turtles and black caimans. Return to the Inkaterra lodge for lunch. After lunch, consider visit the remarkable Inkaterra Canopy Walkway and Anaconda Walk. Ascending the first tower, 29 meters above the forest ground, you begin your encounter with the treetop realm. For more than a quarter of a mile, you will literally walk through the rainforest canopy on a suspension bridge network linking eight observation platforms. During this hour-and-a-half expedition, be on the lookout for bright toucans, woodpeckers, trogons, monkeys and the three-toed sloth. If you wish you may extend your excursion and appreciate the sunset from one of the towers. After your descent from the Canopy, experience the Anaconda Walk for about 30 minutes along the 200-meter wooden bridge over the Aguajales swamps. In this lush eco system, you may observe the various species of amphibians, birds, mammals, abundant flora, trees and there is a possibility to see serpents of this flooded marshland. The walk finishes by returning to the lodge. Once at the lodge, enjoy the daily nature presentation in the Eco Center. Dinner starts at 7:30 p.m.
Day 3:Enjoy a full breakfast before departure. A 45-minute return trip by boat on the Madre de Dios River takes you to Puerto Maldonado, where you may visit Inkaterra Butterfly House. Peru boasts the greatest variety of butterflies in the world, with 3,700 known species. Many of these can be seen at the Butterfly House, a showcase for the variety, beauty and adaptability of these fascinating insects.